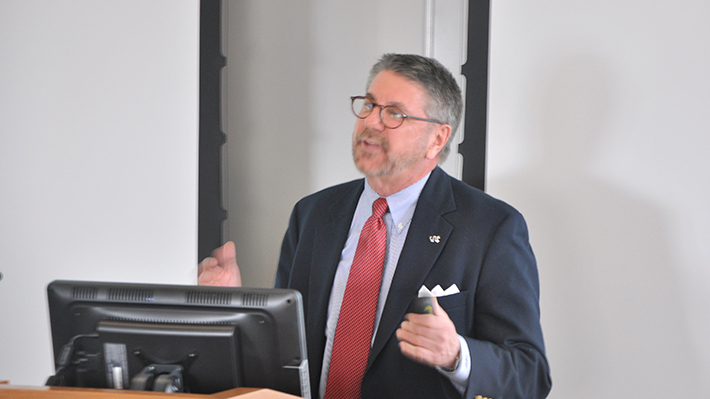 Kyle Wescoat ’74 recently visited Drexel LeBow to talk to students about his journey from Drexel student to CFO of various tech and fashion companies, including Skullcandy and Vans, and discuss the role of and expectations facing middle-market CFOs. Currently, Wescoat is CFO of Emulex. Wescoat loves his line of work – especially the fast pace and making important decisions – and says being a middle market CFO is a great job for several reasons, including the variety of types of things he deals with and the large contribution he makes to his company’s success. His career has also taken him to many countries around the world. He spoke about the course of his career and the importance of what he calls “accidents in time.” For example, he says he landed a dream job a few years back – CFO of the LA Dodgers, only to get let go after one season. “Then the recession hit,” he says. Baseball sales were way down, but Wescoat wound up at Vizio, “which excelled right through the recession” with sales of its flat screen TVs. So in the end, it worked out good for him, even though he didn’t realize it initially. One piece of practical advice he advised students to consider is learning a foreign language. “I sit in rooms where maybe there are 30 people, 15 from one country, 15 from another. The meeting is conducted in English, but after it ends half the room starts having side discussions in a foreign language.” He says only people who speak both languages have the full benefit of knowing what’s going on in that room. “Do it while you’re young,” he advised them. Junior accounting and finance major Andres Vivas Lopez has been awarded a $10,000 scholarship from AICPA – the American Institute of CPAs. He accepted this award onstage at ALPFA’s national convention in Orlando, Fla. KPMG sponsored four LeBow students to attend the event.